Facial skin retains its youthful, vibrant glow thanks to a resilient framework of connective tissue formed by the proteins collagen and elastin, and water-binding glycosaminoglycans. These molecules make up the skin’s extracellular matrix that supports the suppleness of the skin. However, free radicals generated by the pervasive ultraviolet rays of the sun are associated with a normal decline in this extracellular matrix. Over time, tell-tale signs of photoaging may appear—wrinkles, redness, and roughness—especially in the sun-vulnerable regions such as the face. 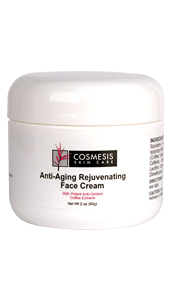 Concentrated coffee extracts can target multiple factors involved in facial skin aging. Scientists have shown that topical application of the highly active coffee compounds supports the natural capacity of the extracellular matrix to replenish connective tissue and restore water-binding molecules. Topically applied caffeine, for instance, helps support the body’s normal removal of ultraviolet light-damaged keratinocyte cells—the process a healthy body employs to inhibit skin photoaging.8 This promotes the appearance of firmer, more youthful-looking facial skin. Arabica seed oil improved skin dryness and promoted the body’s natural production of collagen and elastin. Caffeine enhanced the visibility of skin smoothness and promoted a reduction in wrinkle depth—with clinical results seen in only 4 weeks. Directions: Apply to clean skin twice a day, morning and night. Ingredients: Purified Water, Safflower Seed Oil, Cyclopentasiloxane, Cetearyl Alcohol, Isopropyl Myristate, Polysorbate 60, Dimethicone, Squalane, Sodium Hyaluronate, Coffea arabica (Coffee) Seed Oil, Coffea robusta Seed Extract, Caffeine, Coffea arabica (Coffee) Seed Extract, Lecithin, Concentrated Tea Blend, Glycerin, Phenoxyethanol, Ethylhexylglycerin, Fragrance. Warmomg" Keep out of reach of children. For external use only. Avoid contact with eyes. If product contacts eyes, rinse thoroughly. If rash or irritation occurs, discontinue use.